After the nice steeps of Mt Washington, David, Sky, and I were in the mood for more. 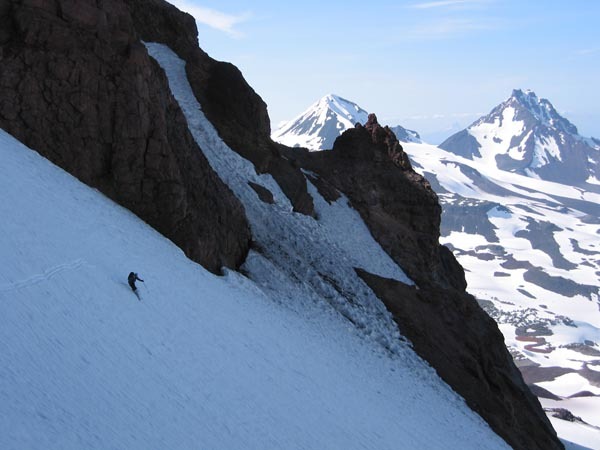 We thought about trying the Villard Glacier on the NE side of North Sister, but I suggested the Prouty Glacier and its steep headwall located on the NE side of South Sister. I had tried this route as an overnight trip via Green Lakes in June of the bleak drought year of 2001, when we found the trail melted out all the way to the lakes, making for a long hike into camp. We had skinned from 7200 ft to the bergschrund at the head of the Prouty Glacier at 9400 ft, and the route above looked steep and inviting, but blisters and exhaustion forced us to turn around that time. This time I suggested a one-day carryover, skinning up the standard route (South Ridge) to the summit and then descending the Prouty Glacier down to Green Lakes, exiting via that trail. As we drove east from Sisters to Bend at sunset, we scouted the route through binoculars from the viewpoint on Hwy 20, and it looked like it would go. So we car camped at the Green Lakes trailhead at 5450 ft, which quite surprisingly and pleasantly had no mosquitoes. Lack of sleep the previous day led to sleeping late on Wednesday morning, and we didn't hit the Green Lakes trail until 9:30 am. Snowpatches soon grew deep and became continuous above 5700 ft. We turned left onto the Moraine Lakes trail and skinned up, following a lengthy and traversing route heading NW, which Sky complained about bitterly (I thought it was fine). We skinned up the standard south side route, with only a short carry needed to cross the bare moraines just west of the Lewis Glacier, and reached the crater rim at 10200 ft just after 3:30 pm. A pleasant ski traverse across the 1/4-mile wide crater brought us to the summit on its northern rim (10358 ft). Winds were light and skies were blue, with only wispy high clouds. We skied off the east side of the summit at 4:30 pm, finding excellent corn-like snow conditions on the slopes above the Prouty Headwall. We tried descending the wide main chute down to the glacier, but were surprised as the snow petered out into a rock band. (In June of 2001, this chute had been completely snow-filled, over 100 ft wide, despite the lack of snowfall that year. Very strange... ) This forced us to traverse into the much steeper southern chute, which easily exceeded 50 degrees but held continuous snow. This was not a place to fall, as a long slide was possible, ending in certain injury on a huge rock protruding from the lower part of the chute. We all used BD Whippet self-arrest grips, which gave us confidence as we skied the steep chute in very good snow conditions and then traversed through an easy gap back left into the more forgiving main chute (about 40-45 degrees), well below the offending rock band. The excellent corn snow continued, as we arced fat turns in this bowl and crossed the well-filled but easily-visible dip of the bergschrund onto the Prouty Glacier at 9400 ft. No crevasses were visible on the main part of the Prouty, although this glacier does show major cracks by late summer. We continued making huge arcs down this wide amphitheater, a magnificent setting flanked by the Middle & North Sisters on one side and Broken Top on the other. This is probably the most spectacularly alpine location in the Oregon Cascades. traversed SE to reach the ridge north of Green Lakes and then followed the southerly slope to the west side of the lakes at 6520 ft (still 4-6 feet of solid snowpack here). A nearly mile-long level traverse brought us to Fall Creek at the outlet of the lakes. This exit held some difficult skiing, as the creek is narrow and flanked by a steep obsidian flow on its west bank, with the snow-covered trail along a steep hillside on the east bank. Eventually after a couple of creek crossings on snow bridges, we were forced to ski up out of the creek drainage and west onto the Newberry Obsidian Flow, which provided some unique skiing along its surface studded with glassy rock towers. We then downclimbed the steep rubbly face of the flow to reach gentler snow-covered slopes on the west side of Fall Creek at 6300 ft. We skied a boot track and then the sticky pollen-covered snow of the wooded trail down to 5600 ft, followed by a quick hike back to the car reaching it after 8:30 pm. A very long and tiring day (we finally reached Seattle at 4 am), but with some superb skiing in an exceptional setting. This up-and-over route provides a very reasonable way to get to and ski the finest steep line on South Sister in a single day. I think that in most years, the less steep and much safer main chute of the Prouty Glacier does remain snow-filled into mid-summer, and I don't know what happened to it this year. Sky launches down the moderate 40-45 degree slopes of the main chute above the Prouty Glacier, after our traverse left out of the much steeper southern chute. In the background are Middle and North Sisters.